Don’t let the intricate patterns shown above fool you! 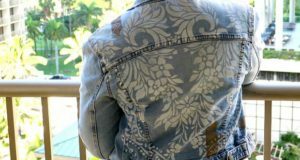 This is a fun and easy DIY fabric painting project that anyone can do. 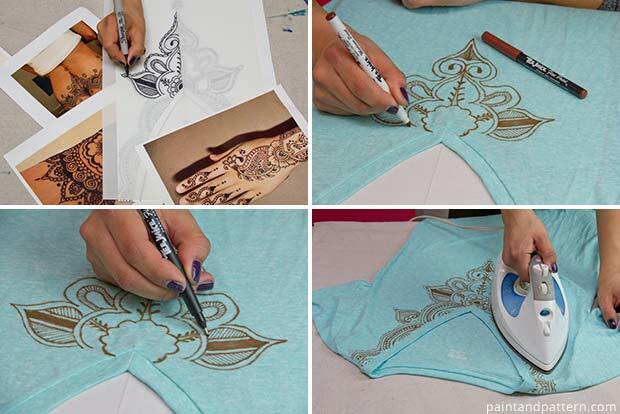 If you can trace with Tee Juice Fabric Painting Pens you can create custom henna-inspired tee shirts like those shown above. Have you ever had the fun experience of having a henna artist adorn you with henna pattern on your hands or feet? Were you mesmerized by the ease that those swishes and swirls seemed to appear and grow into a beautiful, if temporary, design on your skin? Even if you have never had that experience, if you are a pattern love you can probably appreciate the intricate beauty of the centuries old art of henna tattooing. I had my first henna tattoo on the first decorative painting trip to Morocco that I led in 2oo8-and every year since! 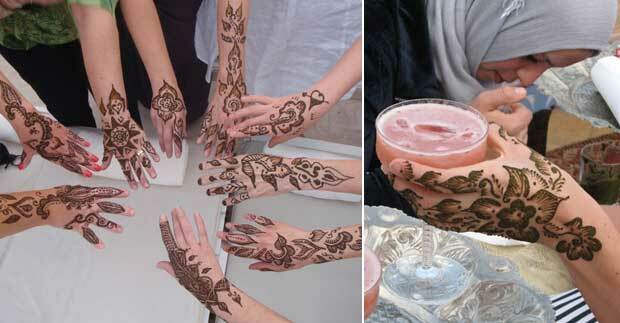 Of course, getting a henna tattoo is especially fun when accompanied by a frothy pink cocktail….. Oh!!! 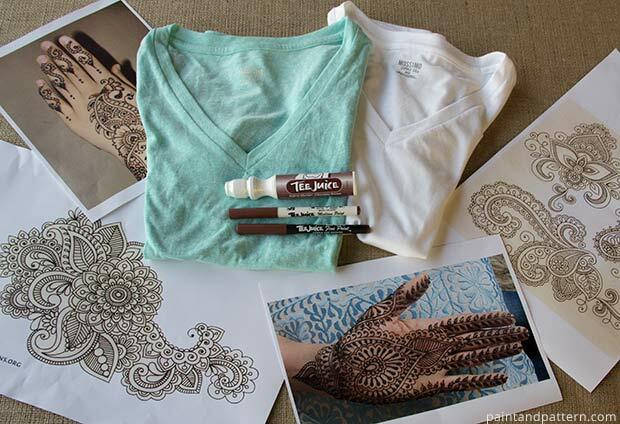 A henna-inspired Tee Juice/Tee Shirt project! A Google image search on the term”henna patterns” or “mendhi patterns” will turn up enough beautiful henna imagery to make you heart swoon and your head swim! The hardest part will be to narrow down your selection. But hey, tee shirts are cheap and just think of the possibilities for gift giving-as well as beefing up your summer wardrobe! I found these tee shirts on sale for about $5 at Target. Look for a smooth, not ribbed, tee shirt material. 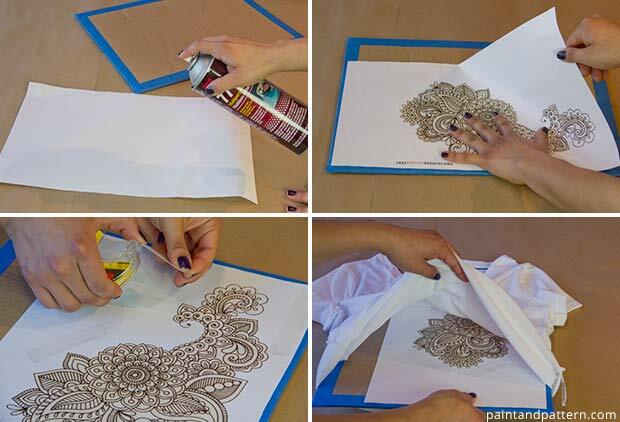 Also, if you plan to trace as opposed to just doodling, make sure that any colored shirts you choose are of a material that is thin enough that you will be able to see through it to trace your pattern. The Tee Juice Fabric Pens from Jacquard are ideal for this project. They are available in 16 colors (including the brown used here) and 3 tip widths. They are designed to remain soft and glide easily on fabric, paper, wood, and leather. I mostly used the Medium Tip, but found the Fine Tip helpful for smaller henna details, and it also seemed to create a crisper line. The biggest challenge when working on a thin, stretchy fabric is to keep it from moving around at all while you are tracing or doodling. In order to create a stable surface to sandwich in between the front and back of the tee shirt, I used spray adhesive to fix one of the patterns I printed off onto a piece of heavy cardboard. Double-sided tape placed strategically on the paper pattern will allow you to smooth out the tee shirt OVER the pattern AND keep it from sliding around as you draw. Take care not smear the fresh Tee Juice with the heel of your hand as you work. It is a good idea to place some clean paper towels under your hand to rest on. If you do happen to get a smear here or there, dab it off quickly with a clean damp cloth. 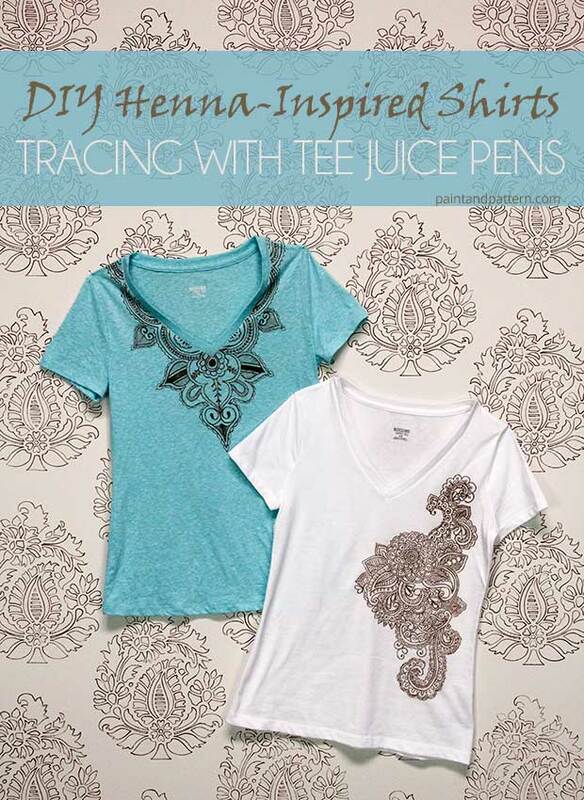 Don’t forget to heat set your finished Tee Juice tracing with a dry iron. You can combine different patterns that you print off to extend your henna design (see last photo above) OR draw off your own unique pattern to trace. 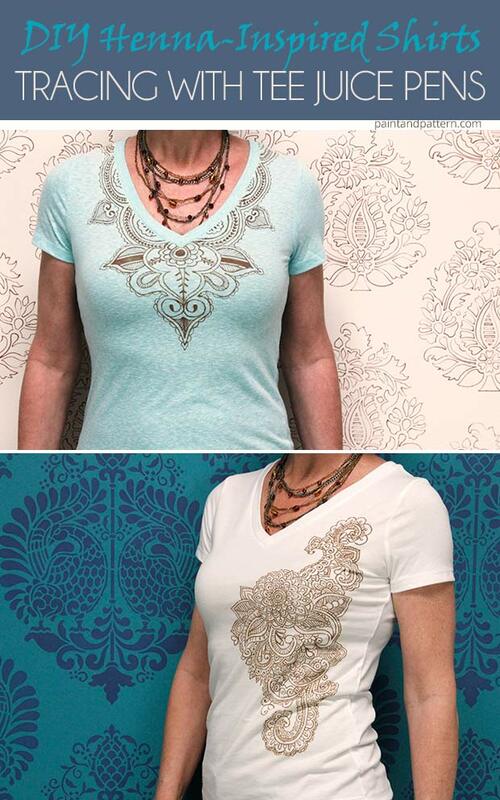 After transferring the shape of the neckline to tracing paper, sketch out your pattern first with a pencil. Once you have the pattern laid out the way you want it, use another sheet of tracing paper to further perfect the pattern with a black Sharpie marker. On a colored shirt, the pattern will be harder to see, so make sure you have super good lighting. 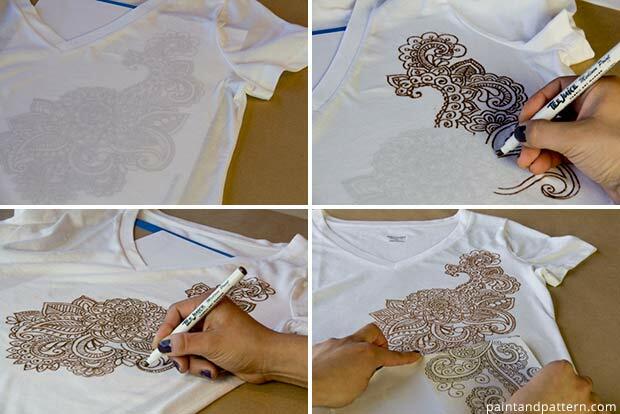 Trace the main parts of the design with a Medium Tip Tee Juice Pen. 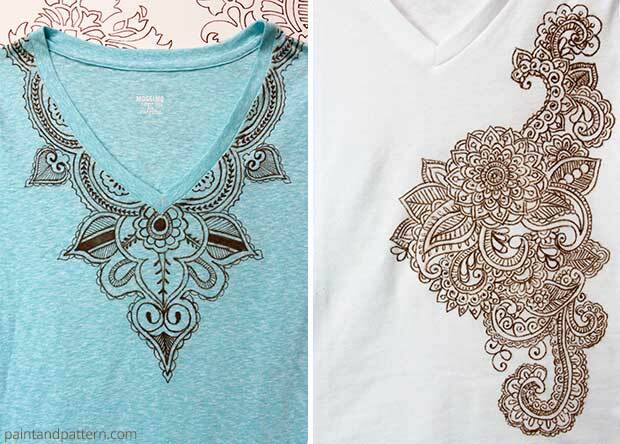 Use a Fine Tip Tee Juice pen to add more intricate lines and details. Iron over the finished pattern to “set” the Tee Juice permanently. Details of the final Tee Juice Pens henna designs. 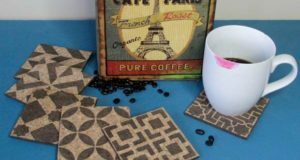 This is a super fun DIY project, and I hope it has your head swimming with henna pattern possibilities! Such as…. Traced henna patterns tablecloths and napkins, oh my! Henna pattern pillows and curtains, oh dear! Henna patterned walls, oh yes!!! Above, you can see bits of me modeling my new “designer” henna tees in front of some stenciled walls. 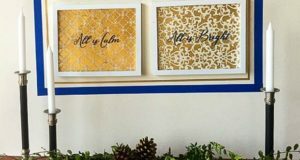 We were so henna-inspired here in the studio we decided to translate the henna look to a wall finish using the new Rani Damask Stencil from Royal Design Studio. We replaced the Tee Juice Pen with a brown Sharpie to get this look. 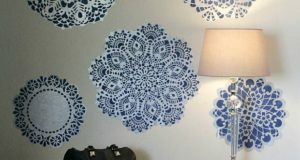 The pattern below is a sneaky peek at the new Annapakshi Damask Stencil in pretty peacock shades. 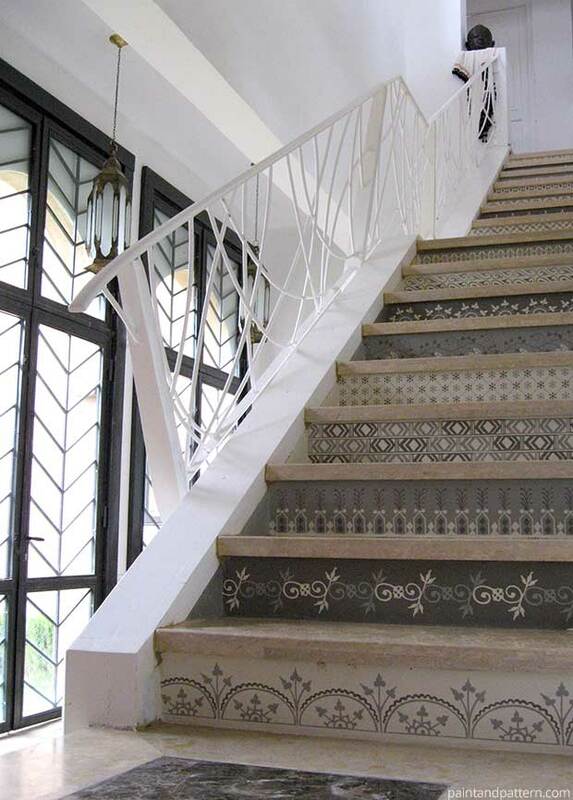 You can find these stencils, and more, in the India Stencil Collection from Royal Design Studio. What do you think? Are you ready to get your henna on too? Yes, my head IS swimming! I love henna patterns, or any other with scrolls. I hadn’t heard of Tee Juice but I certainly have a collection of Sharpies to play with for the time being. Thanks for this! This is a great way to dress up a simple t-shirt. I don’t know this Tees juice, but here in the Netherlands you can buy markers for fabric. I think that is pretty much the same? For sure I will try it! Wishing you all a creative, sunny day! incessantly insiee caqse you defend this hike. I’ll immediately grasp your rss feed as I can’t find your email subscrioption lnk or e-newsletter service. Do you’ve any? Please let mee know in order that I could subscribe. it’s rare to look a great weblog like this one these days..
material, now that’s user genial (:. mme to ttry and do so! Your writing style has been amazed me. What i do not understood is if truth be told how you’re now not really a lot more well-appreciated than you might be now. view imagine it from numerous numerous angles. it’s one thing to do with Woman gaga! Your individual stuffs outstanding. Hey there, You have done a fantastic job. I will certainly digg it and in my opinion recommend to my friends. obtain information about my presentation focus, which i am going to convey in college. happen to be both conventional and newest games. It is currently offering a welcome bonus as high as 500 without having deposit needed. any formula or consult an e-book that some other roulette systems cause you to do. interview, it may cause delay or denial of the visa. Yes! Finally someone writes about fotbollströjor barn. On every full house win, you here can grab the jackpot associated with it. in the end, the outcomes that the random list of numbers can generate will tend to consume a list of rules.